LITEFLAM is Greenlite Glass Systems' proprietary fire-rated glass. Since 2006, it has been used in more than 100 completed projects worldwide. We are the leaders in fire-rated glass floors and walkable skylights. We assist the modern architect with a vision to create open light-filled spaces by bringing natural light deep into the building, creating a vibrant, inviting atmosphere. Whether the goal is to allow natural light to flood to subterranean levels or to build glass bridges in atrium spaces which also require fire-separations, LITEFLAM glass floors/skylights and the team at Greenlite Glass Systems can assist with the design needs. 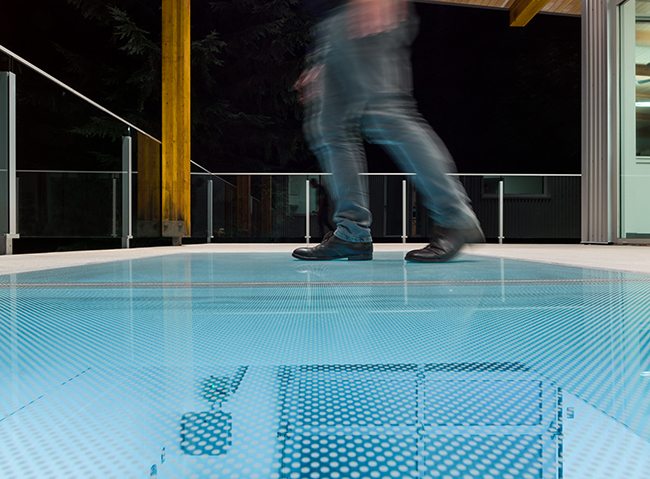 This advanced glass floor system is load bearing and fire-rated from 1 to 2 hours – the only exterior glazed system, insulated glass assembly for North America. LITEFLAM can be used as a durable, non-slip walking surface, with a standard live loading of 100 psf but can be engineered to take higher loading if required. Many architects and specifiers are well-versed with regard to American National Standards Institute (ANSI)/Builders Hardware Manufacturers Association (BHMA) standards for builders’ hardware used throughout North America. These standards typically pertain to commercial, institutional, and industrial facilities, covering everything from hinges to locks to power doors. Accessibility and barrier-free design notwithstanding, the North American Fenestration Standard (NAFS), referenced in the 2010 National Building Code of Canada (NBC), sets different operating force limits for standard CW and AW Performance Class windows. There are inherent differences between window types.